Condé Nast Traveler recently announced the results of its 27th annual Readers’ Choice Awards with The Lodge & Spa at Brush Creek Ranch recognized as the No.2 Top Hotel & Resort in the World, with a score of 98.661. More than 76,600 dedicated readers cast votes for 7,721 hotels, 642 cities, 453 cruise ships, and 148 islands, in an average survey time of 16.5 minutes. The result? The 1,182 best travel experiences in the world. The Lodge & Spa at Brush Creek Ranch, a Preferred Boutique Hotel and ORVIS dual-endorsed fly-fishing and wingshooting lodge, is an exclusive, independent guest ranch set amid a century-old working cattle ranch outside of Saratoga in south central Wyoming's North Platte River Valley. Sitting on 30,000 acres and bordering a million acres of federal wild lands, Brush Creek Ranch's Grand Lodge and collection of new and renovated historic guest cabins and quarters are open to destination weddings, private corporate events and family vacations. 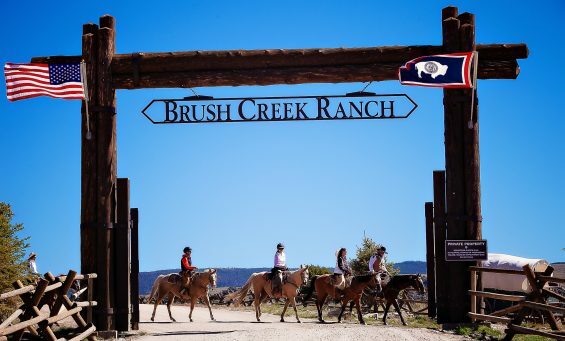 Offering an unsurpassed, all-inclusive luxury dude ranch adventure experience, The Lodge & Spa at Brush Creek Ranch provides a genuine Western spirit of hospitality and a vast array of outdoor activities that, coupled with an inspiring landscape and a dedication to sustainable ranching, come together to create a new icon in luxury Western destinations. This year, Condé Nast Traveler introduced two new categories: Hall of Famers, iconic properties that debuted in the first Readers’ Choice Awards; and The Newcomers and The Comebacks, new and recently refreshed properties that are destined to become future classics.